The federation of Australia was the way that the six separate British colonies of New South Wales, Queensland, South Australia, Tasmania, Victoria and Western Australia joined together to become one country. When the Constitution of Australia came into force, on 1 January 1901, the colonies became states of the Commonwealth of Australia. 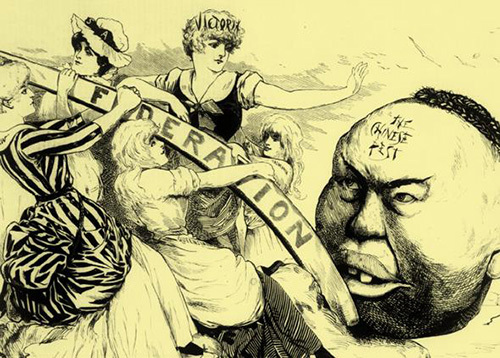 People had been trying to get the colonies to join together in a federation of Australia during the 1850s and 1860s. 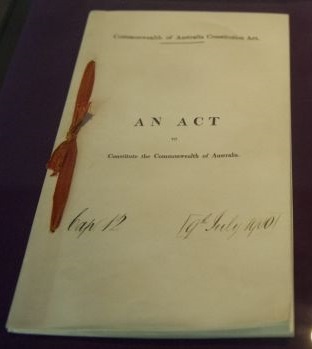 In the 1890s, a number of big meetings, called conventions, were held to write a constitution for Australia. Sir Henry Parkes, Premier of New South Wales, was the main person supporting this idea. Fiji and New Zealand were going to be part of the federation but decided not to join the federation. As soon as the Federation happened, Sir Edmund Barton was put in charge as Prime Minister of Australia until the first Australian elections were held. Barton won the election and continued to be the Prime Minister. The letters patent issued by Queen Victoria creating the office of Governor-General, issued in 1900 as a part of the process of implementing the new federal constitution. The Royal Exhibition Building in Melbourne is the site of the first sitting of Federal parliament. Federation of Australia Facts for Kids. Kiddle Encyclopedia.